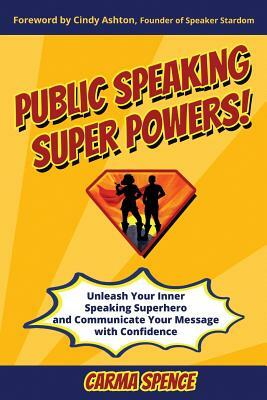 IF PUBLIC SPEAKERS WERE SUPERHEROES, WHAT WOULD THEIR SUPERPOWERS BE? AND, COULD YOU DEVELOP THOSE SUPERPOWERS YOURSELF? Author Carma Spence asked these questions of dozens and dozens of speakers and discovered the answer was, "Yes "
Three out of every four people suffer from speech anxiety, and research suggests that people who don't confront and overcome that fear are less successful in their careers and lives. However, people often look at successful speakers as superheroes with superpowers they, as mere mortals, could never possess. and much more... There is even a bonus chapter on the business of speaking.